Paperairplanes.net will do a demo at ZamFest in West Los Angeles, Sunday September 23, 2012. I'll be there for the whole event 10am to 5pm. Participants will have table space to try their skill at folding along with me in several sessions during the event. Space at the table will be limited to a few people at a time so be sure to check the schedule and reserve a spot for the design(s) you are most interested in. More space will be available for those who just want to look. I'll also do some presentations just for watching. Check the Zamfest website for details about the location and event admission. It costs a few bucks to get in but my presentations and instruction will be at no additional charge. I may offer some merchandise to enhance your fun but not sure about that yet. Blank 8.5x11 inch paper will be provided free. This is an all ages show. I started designing in about 4th grade and since then have gotten a little more sophisticated and it's still some of the best fun ever. Welcome to PaperAirplanes.net, presenting these three amazing designs. For further introductory descriptions click on Originals. For a little flying animation of the Moth, click here on Flyby. Why am I so jazzed about paper airplanes? It's because they're a renewable resource- when they wear out or get lost, you can just make another. Never any trips to the store for expensive replacement parts! A spare sheet of paper is nearly always available. A good paper airplane is more fun than many toys that cost a lot. In folding an airplane you can use your creativity. It is a very relaxing and satisfying craft. And, outdoor flying is a great way to get some fresh air and sunshine! 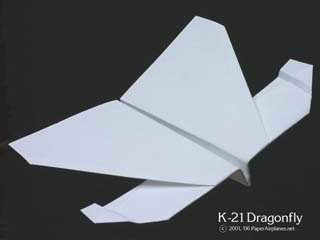 The range of techniques for creating airplanes of paper runs a wide gamut. Elaborate designs are constructed by assembling many cutout parts, with glue or otherwise. Some simpler models are augmented with tape, paper clips, and trimming with scissors. The focus here for now is on minimalist use of any materials or tools other than standard sized sheets of paper. A folded design that holds together without additional materials is an ideal in this genre. 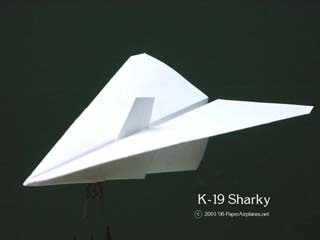 Hi, I'm Jim Kendall, creator of the K-19 Sharky, K-20 Moth, and K-21 Dragonfly. 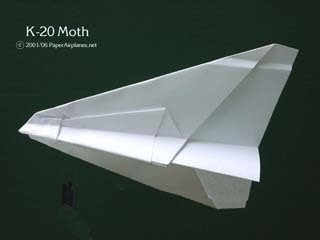 I started designing paper airplanes when I was about 9 after seeing 1967's Great International Paper Airplane Book.